Boyd Raeburn CDs @ Hep Records, jazz in depth from the 1930's to the present day. Born in Faith, South Dakota, on October 27, 1913, Boyd Raeburn moved to Chicago where he was educated at the University of Chicago. Here the music bug bit him and he formed a dance band which performed at the 1933 Chicago World Fair. The music was evidently of its time, and it was not until 1942 that he began to seriously consider leading a jazz orchestra. He commissioned arrangers such as Marge Gibson to write a jazz band library. By early 1944 he had reorganised radically and with a band largely composed of bop players in the making like Earl Swope, Sonny Berman, Don Lamond, and arrangers George Williams and Ed Finckel he played a series of New York Hotels. Initially there was a Basie and Ellington influence and even his main soloist, Johnny Bothwell on alto, was called the white Johnny Hodges. Pianist/composer George Handy joined later that year and introduced advanced arrangements but then left for Hollywood. In January 1945 the band appeared for a week at the Apollo in Harlem, a rarity for a white group, and featured guest Dizzy Gillespie in the trumpet section. The band broadcast from New York but was unable to secure a worthwhile recording deal and the leader decided to try the west coast where he opened at the Palace Hotel in San Francisco in July of 1945. Here George Handy rejoined and submitted more adventurous arrangements and original compositions. This was the real beginning of the Raeburn legend. The band worked its way down to Los Angeles where in October it ran out of bookings and had to temporarily disband. Then two recording contracts came to the rescue - one with the Jewel Recording Company and the other with the Standard Transcription Library Service. For the next three months the band recorded most of the new Handy originals and his unusual treatment of standards. Also singer Ginnie Powell, who had actually been with the 1943 edition, rejoined and became Mrs Raeburn. The music press was enthusiastic about the music but the major companies still backed off, regarding it as too advanced. This was true as Raeburn and Handy had decided to present concert jazz - a concept whose time had not yet come. The orchestra only secured one residency at the Club Morocco in Hollywood and here it reached its peak in the Summer of 1946. Despite continued press coverage and informed critical support Raeburn could not make money and by the end of the year he disbanded and returned east to try his luck there one more time. He engaged arranger Johnny Richards, who had replaced the increasingly difficult George Handy, to write a new library. The new orchestra boasted soloists such as Pete Candoli and Buddy De Franco and opened at Vanity Fair, a plush new venue in mid-town New York. Again the reviews were encouraging but the music was uncompromising and by late summer of 1947 it broke up. The following year Raeburn organised another band which was somewhat tamer but again he disbanded after a few months. In the mid 50s after his innovative fervour had gone, Raeburn was invited by Columbia Records to make three albums with an orchestra of top New York session players. Those albums are a disappointment and have little in common with his brilliant attempts to break jazz orchestral moulds in the mid-40s. He left music and died August 2, 1966. Featuring Dizzy Gillespie, Lucky Thompson, Ray Linn, Britt Woodman, David Allyn and Dodo Marmarosa 1946. Broadcast performances by one of the mould breaking orchestras of the post war era. Titles - Tonsillectomy / Picnic In The Wintertime / Night In Tunisia / Rip Van Winkle / Yerxa / Eagle Flies / Temptation / Boyd Meets Stravinsky / Caravan / Two Spoos In An Igloo / Body And Soul / Memphis In June / I Don't Care Who Knows It / How Deep Is The Ocean / Boyd Meets Stravinsky / That's Where I Came In / Dalvatore Sally / Hey Look - I'm Dancing / Grey Suede, Special Maid / Keef (KeyF) / Night In Tunisia / Hep Boyds. Boyd Raeburn - "Eagle Flies"
Transcriptions and broadcast performances 1945-48, featuring Ray Linn, Lucky Thompson, Frank Socolow, Dodo Marmarosa, Buddy DeFranco, Pete Candoli, Hall Schaeffer, and the arrangements of George Handy, Eddie Finckel and Johnny Richards. Titles - Tonsillectomy / Forgetful / Rip Van Winkle / Yerxa / If I Loved You / Intro Theme - Memphis in June / Night in Tunisia / I Don't Know Why / March Of The Boyds / Intro Theme / In The Still Of The Night / So Would I / Blue Skies / Man With A Horn / Stormy Weather / Scheherezade / Boogie Boyd / Wanting You / Yesterdays / March Of The Boyds / Begin The Beguine. 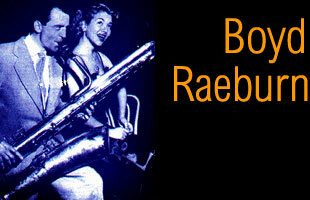 Boyd Raeburn - "Boogie Boyd"
Featuring Ray Linn, Lucky Thompson, Britt Woodman, Dodo Marmarosa, David Allyn, Ginnie Powell - and the revolutionary arrangements of Eddie Finckel and George Handy from 1946. Titles - Boyd's Nest / Blue Prelude / High Tide / Picnic In The Wintertime / Are You Livin' Old Man / Tush / Concerto For Duke (Mood Indigo, C Jam Blues, Sophisticated Lady, It Don't Mean A Thing) / Where You At ? / Out Of This World / Boyd Meets Stravinsky / Personality / Dalvatore Sally / Blue Echoes / I Only Have Eyes For You / Two Spoos In An Igloo / Temptation / I Can't Believe That You're In Love With Me / I Don't Know Why / More Than You Know / Amnesia / Night in Tunisia / I Cover The Waterfront / Foolish Little Boy.